On September 29, I joined two dozen other taiko players in the livestock building at Hastings Park for Durational Taiko – a marathon drumming session that harkened back to taiko’s original ceremonial function in rural Japan, long before it was adopted as a peformance art form. 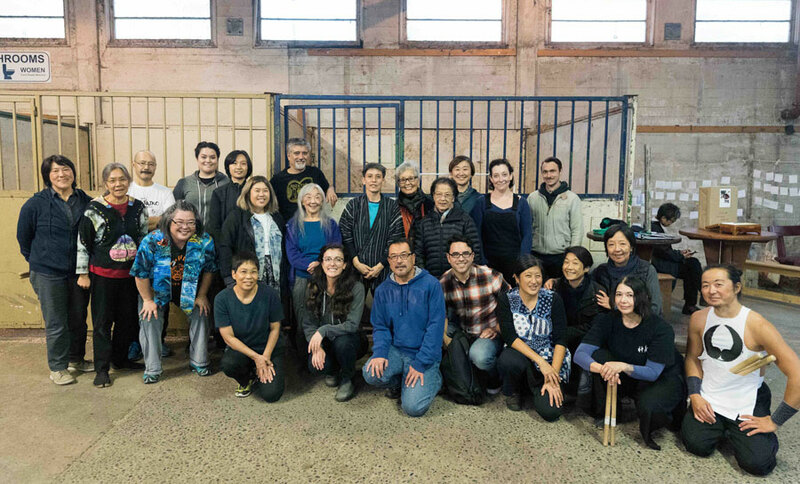 Durational Taiko is the brainchild of longtime taiko drummer Elieen Kage, who says, “When I visited Japan during certain festivals or ceremonies, there would be taiko played for hours and days repetitively. I was impressed with how that effected me and the community that was part of the ceremony. For a few years, I had wanted to have a way for us to play taiko in this original context.” The session was sandwiched between two performances of Japanese Problem. Taking part in Durational Taiko at Hastings Park proved to be a powerful experience for me. To hear the drums reverberating though the building, with its many ghosts – and memories – was meaningful in a deep and unexpected way. Although my maternal-side family was in Moose Jaw prior to World War II, and so never went through Hastings Park, I have immersed myself in the history of those bitter/sweet years, and I found myself moved beyond words. Over the course of the four-hour drumming session, a number of people came to the microphone to read the names of some of those incarcerated at Hastings Park before being dispersed outside the hundred-mile “protected zone,” and to share some thoughts and feelings with the drummers and witnesses. Those who spoke gave even greater weight to what was already a meaningful ceremony – their emotions were palpable. I hope it provided some sense of, if not closure, at least relief. What really moved me, though, was when those who had been observing joined in on Tanko Bushi, forming a second circle within the circle of drums – at that point it felt like a spontaneous obon, a laying to rest of the dead. Listening to the voices and fue (bamboo flute) rising about the thunder – and watching the arms dancing in the air, the feet stirring up the dust of decades – I was transported. What a truly wonderful and honouring way to end the day. From a drumming point of view, I felt my muscles cramping up very early on and I thought, “oh great, I’m going to have to stop,” but it quickly passed and the last three hours weren’t an issue. As a longtime taiko player, this Duration Taiko was a new experience. Neither practice not performace, nor even jam session, it was an excercise in letting go – letting go of preconceived notions of what it means to play taiko in front of others, letting go of sore muscles and a wandering mind, letting go of structure, and letting go of ego. With the observers bearing witnesses, and the ghosts of those once incarcerated there dancing in the dust motes, time began to lose all meaning, or maybe that meaning was itself transformed.